“It is now six years since the secret disaster at Jurassic Park, six years since the extraordinary dream of science and imagination came to a crashing end–the dinosaurs destroyed, the park dismantled, the island indefinitely closed to the public. As a child, I was never really that interested in dinosaurs. If only I had read this fantastic series! 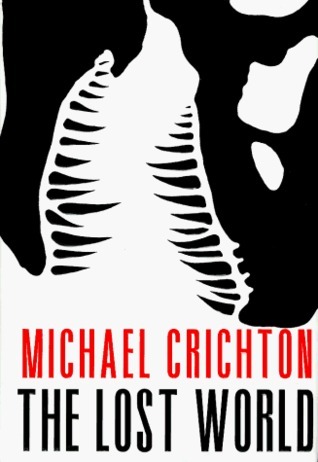 After reading Jurassic Park a few months ago I have a great appreciation for dinosaurs and all things Jurassic, including Michael Crichton’s sequel, The Lost World. While this second installment doesn’t reign victorious over the first novel in my opinion, it nevertheless provides an immensely enjoyable, suspenseful, and entertaining reading experience. This sequel is different enough from the first novel to feel like a new story, but similar enough to connect the two together. The inclusion of the mathematician Ian Malcolm helps to create this bridge, despite some controversy over the ending of the previous novel. Apparently Malcolm was supposed to have died in Jurassic Park, yet here he is in the sequel. Personally, I think it’s great that Crichton carried him into The Lost World. Not only is he funny, but his interjections of chaos theory and practical common sense are refreshing compared to the more impulsive, radical characters. It may have flaws, but chaos theory makes a strangely large amount of sense in my mind, so I’m always fascinated to hear him talk about it. Learning about the other island and what it is for is such a clever plot twist and connection to the previous story. There are a lot of little details from Jurassic Park that add up perfectly with this new explanation, meaning that Crichton carefully planned out how he would continue the series. If not, then he’s got a talent for weaving great stories on the fly! In today’s culture of rising feminism, it’s always exciting to read about a heroine who is both caring and daring. Dr. Sarah Harding embodies these characteristics as she fights to survive on the island, not only to help herself but to protect the children as well. She’s smart and courageous but still has a big heart, which makes her an essential member of the character cast. One thing I love about these books is their ability to terrify me. I usually read in my bed at night before going to sleep, and Crichton has certainly caused me to think twice before ultimately turning off my light! With my eyes wide, grasp tight on the book, and heart thrumming with excitement, it’s easy to see why this world of dinosaurs is so addicting. This story is truly suspenseful in a way that will keep you reading regardless of what time of night (or early morning!) it is. Overall, The Lost World is an impressive sequel despite the incredibly large shoes it has to fill. I didn’t enjoy it more than Jurassic Park, but I honestly wasn’t expecting to. It was just too good! Still, this sequel is well worth reading, especially if your thirst for genetically modified dinosaur fun hasn’t yet been quenched! Would I recommend it to a friend? : Absolutely!! But I would suggest reading Jurassic Park to get a better idea of what’s going on. Have you read this book before? What did you think of it? Would you recommend any of Michael Crichton’s other novels? Let me know in the comments section below! Next > Top Ten Tuesday: Bookish Nature! I actually haven’t read any of the Jurrasic Park/World books … I’m thinking I maybe should though.